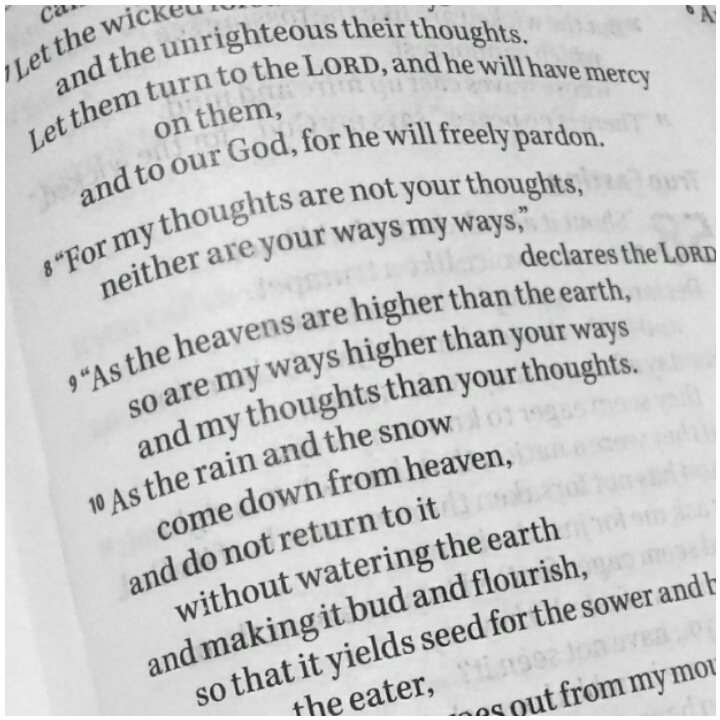 God's thoughts are not like your thoughts. Well this has to be one of the hardest lessons we ever have to learn! And I still struggle with this one! I have a lot of thoughts. Most of them, I believe to be true, right and correct. I mean, I have a lot of opinions and I am pretty good at arguing a good point. It's very rare that any of us believe ourselves to be wrong. 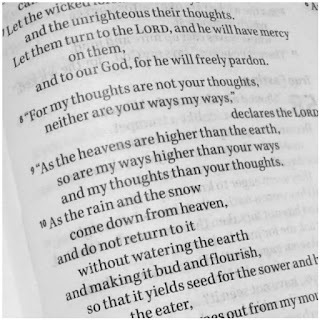 So how does it feel to know that God's thoughts are not like our thoughts? 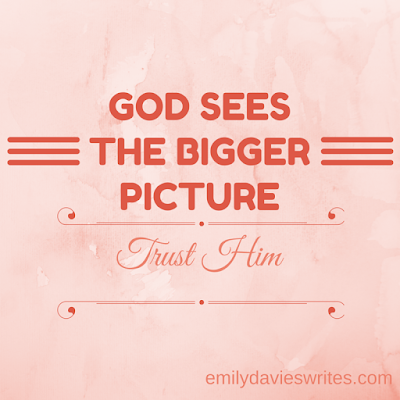 God's plans are not necessarily the same as our plans. God's desires are not necessarily the same as our desires. God's dreams for our lives are not necessarily the same as our dreams for our lives. Now, I'd like to think that for the most part, my dreams are aligned with God's dreams. My thoughts are aligned with God's thoughts (although I doubt he's too impressed with those secret, bitchy thoughts that I really shouldn't allow air-time). I'd like to think that my plans are aligned with God's plans. Wouldn't we all? But sometimes, when things aren't going our way we might start to question those thoughts. And here's the key to remember. God sees the bigger picture. Trust His bird's eye view. God sits outside of time. He knows everything. He knows what's going on in the future. He knows how other people are feeling. He knows. He knows what's going to turn out for the best. Yesterday I had to apply suncream to Ruby. She didn't like it. She didn't understand the purpose in it. It made her uncomfortable. She wriggled and squealed and whined. As her parent I saw the bigger picture. I knew what the alternative to wearing suncream was - pain, discomfort, long term skin damage, maybe even cancer! I knew what was best for her even if she didn't see it herself at the time. So when God's thoughts and plans turn out not to be your thoughts and plans, try to align yourself with God. He does know. He does see. And ultimately He will prove to be wise and all-knowing. He knows what's best for you.